If you are an author in this day and age, keeping up with the requirements of social media, promotion, events - oh, and writing - is difficult enough under one name. Imagine doing all that with three? During the event she answered questions about how she became a writer, the big influence made on her by a wonderful remark from an English teacher - and how music is key to setting the 'soundscape' for when she writes. In fact, pumping snippets of music through the hall's PA system (which wasn't up to the job of some of the bass) we had a 'name that tune' quiz linked in with some of the characters. Wow, so much stuff. 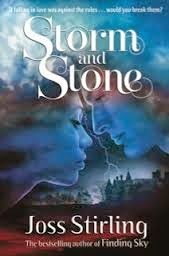 But at the moment I'm working on the next 'Storm and Stone' book, it's going to be called 'Stung' (at the moment) but, with it being a book I write as Joss Stirling, the cover is beng reworked to align it more with my Finding Sky books. The design is a filigree-like scorpion and it'll look amazing! Can I have two? The first is the 'kill your darlings' tip, it's so true. But I remember listening to Marcus Sedgwick talk about the writing process (we were both teaching on an Arvon course). He's much more of a plot-driven writer, I like to start with character. And he described the plotting aspect of writing as creating 'stepping stones' that can be pinned up or drawn on a board. It really influenced me, and I have definitely tried to write more in that way. The best is just the joy of writing, and the reaction of readers - it happened here today where some of the girls came up and described themselves as real fans. To be part of someone's life like that, it's a privilege. The worst aspect - I think it's the requirement to think commercially. The path to being published is a hard one, and getting harder - even for established authors (one big change is the requirement for established authors to submit full manuscripts, there is less trust from publishers to rely on an author's past performance and reputation, which was the way things used to be done). I guess to some extent I had it easy at the start, roughing out the first books wasn't that much of an issue for me, but the way that I have approached this problem is to constantly reinvent myself - hence writing under different names. I'm not sure I need to have anything in place, but I definitely need a place 'in my head' to start writing. Even if I'm in a public place, I use music to shut myself off <thinks for a bit> I guess I need to create some privacy, wherever I am, does that makes sense? My first book. Simple as that. I went from unknown debut to established writer in a very short space of time, I appreciate how lucky I am.